The Dutch North Sea Coast is a place of extraordinary beauty. 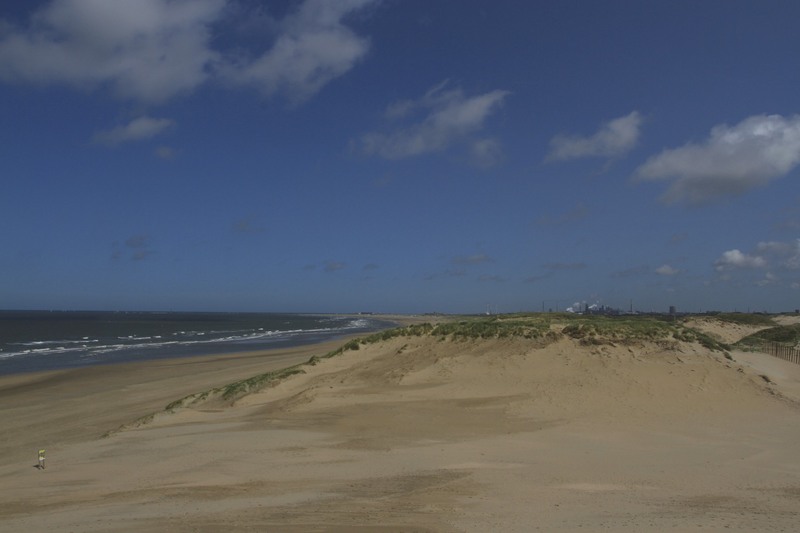 Vast stretches of wide sandy beaches are backed by rolling dunes, large parts of which are protected areas or national parks. 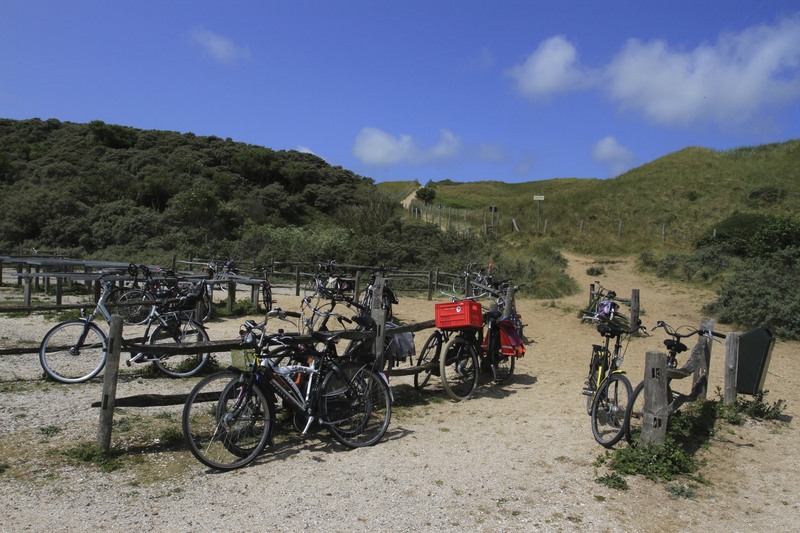 On a bad day, with wind and rain sweeping inland from the dull greyness of the North Sea, this can be one of the most inhospitable places imaginable; on a warm sunny day though it is transformed and makes for fantastic cycling. 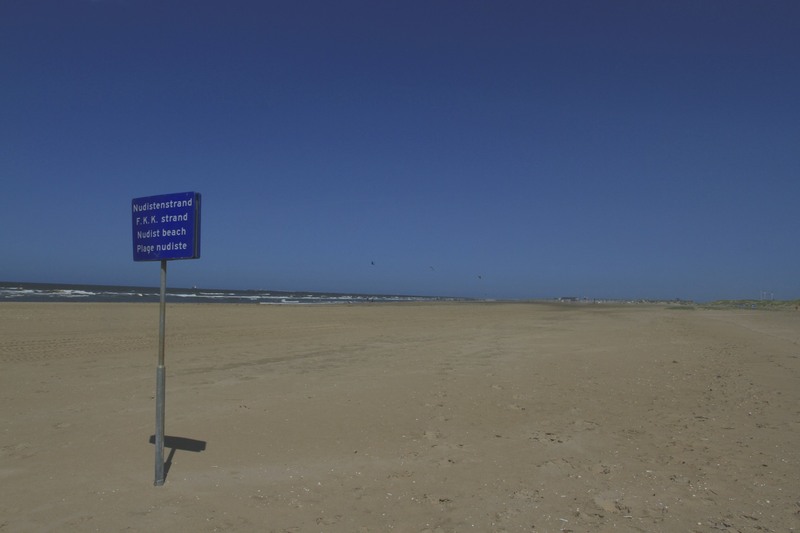 I’ve slowly been exploring the coast north and south of The Hague by bike. The extensive network of cycle paths along this coastline takes you away from roads, traffic and towns, plunging you into nature. 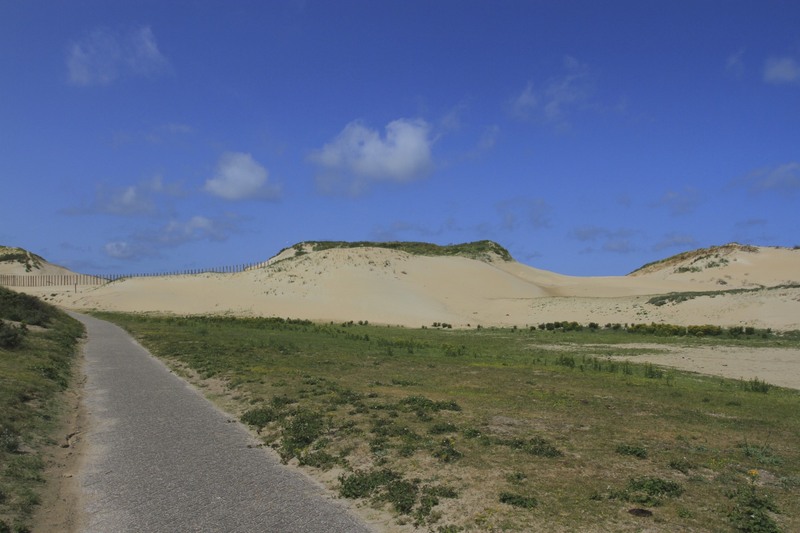 I got the train to Heemstede and headed through typical rural landscapes that slowly changed into a landscape of sand dunes near the coast close to Bloemendaal aan Zee, the last town before entering the truly wonderful Zuid-Kennemerland National Park. 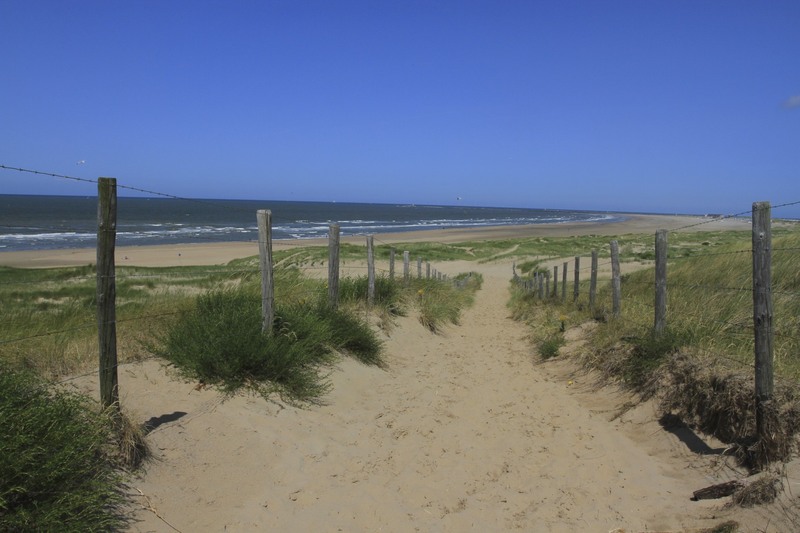 My plan was to explore the park and the beaches before going onwards to the North Sea Canal, which connects Amsterdam with the open sea. 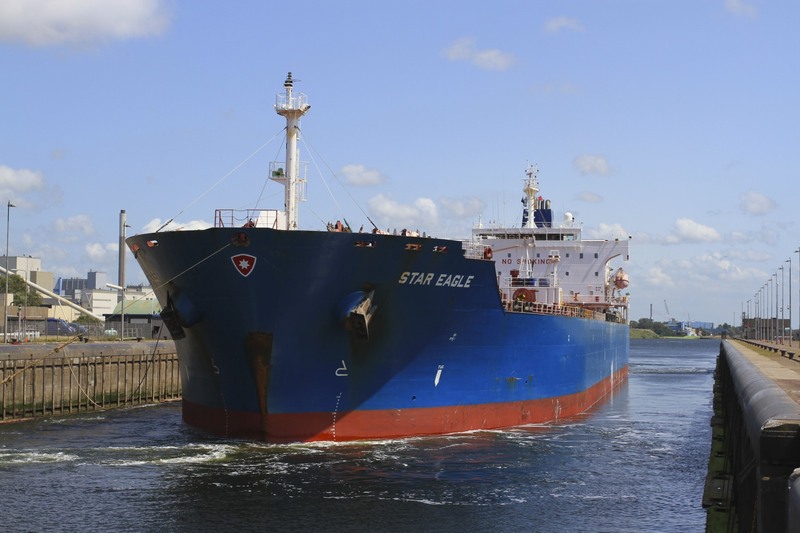 Oceangoing ships of up to 90,000 tons sail down the canal to the Port of Amsterdam, and the locks that control the access are huge. After that the lovely city of Haarlem was my final destination for a well deserved glass of beer from Haarlem’s local Jopenkerk brewery. 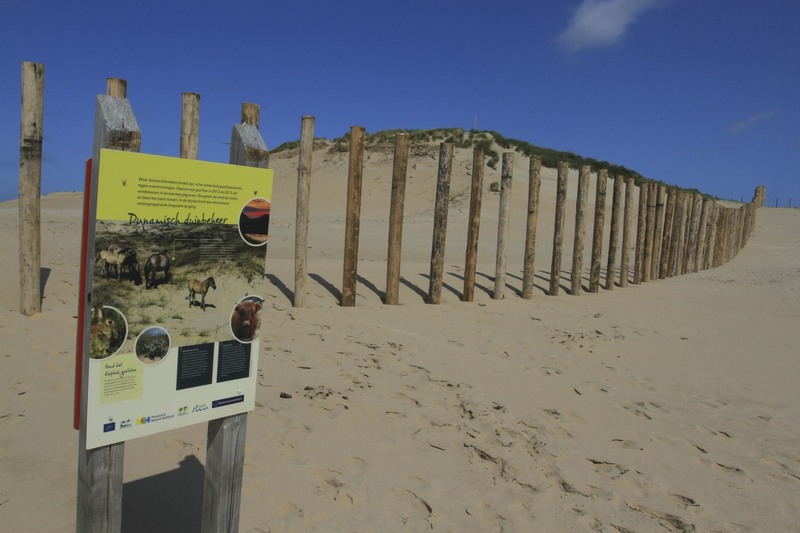 I’d wanted to visit Zuid-Kennemerland National Park for a while. 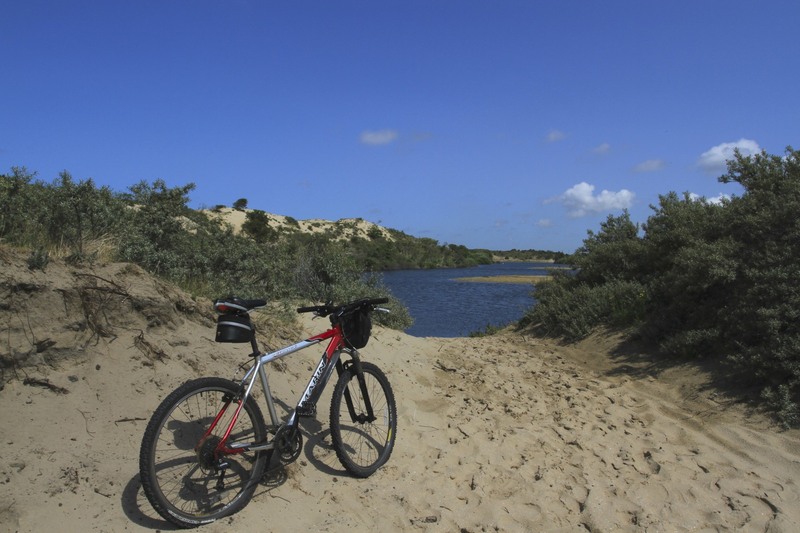 The remarkable mix of woods, dunes and lagoons are home to a wide variety of flora and fauna, much of which is quite rare in the Netherlands. As well as over a hundred varieties of birds are joined by more than twenty types of butterfly. 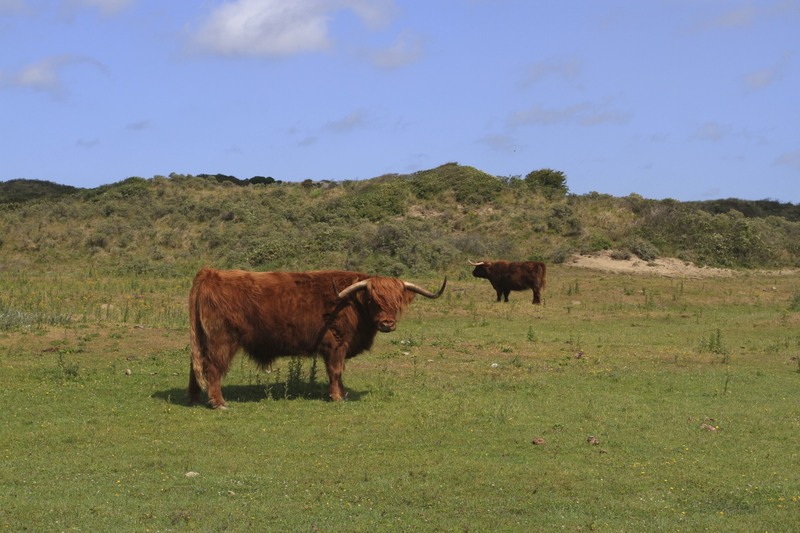 The park is also home to deer, red foxes, squirrels and, most excitingly, Highland Cattle, semi-feral Konik ponies and a small population of Wisents, the European Bison. I didn’t get to see any Wisents, but I did get up close and personal with some Highland Cattle and Konik ponies. 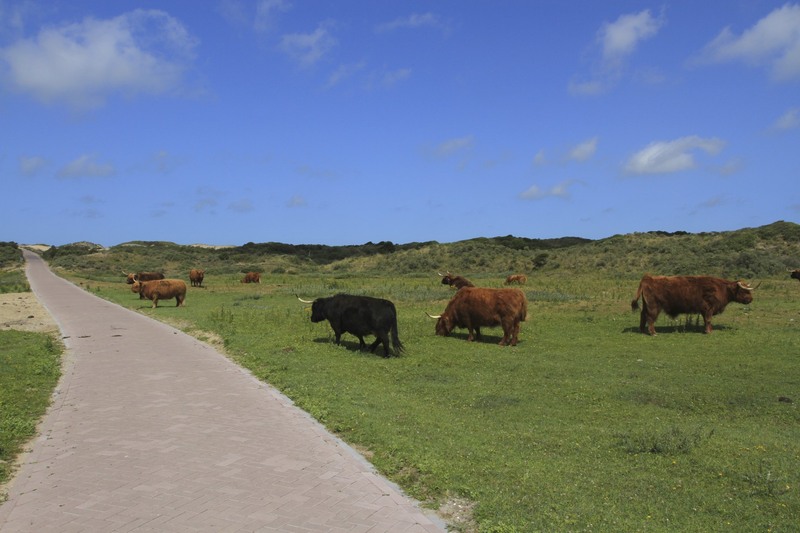 I have to admit it’s quite unnerving to have to cycle through a group of Highland Cattle that have wandered onto the cycle path. Those horns could do a lot of damage, even unintentionally; after a close run-in with a bull on a railway platform in India a few years ago I’ve become a little cautious around horned creatures. 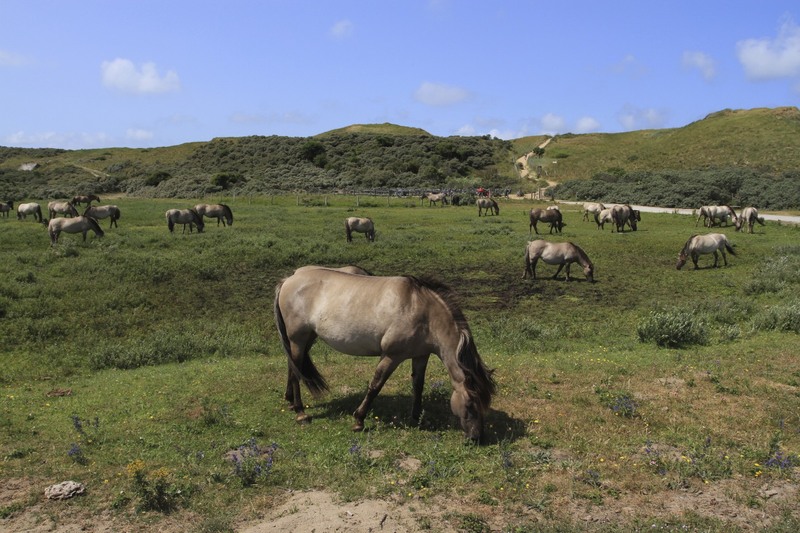 Passing through a landscape of shrub-topped golden dunes, I cycled through a large group of Konik ponies on my way to the beach. When I came off the beach a while later the ponies had migrated to the bike park so I could get a close look at them. 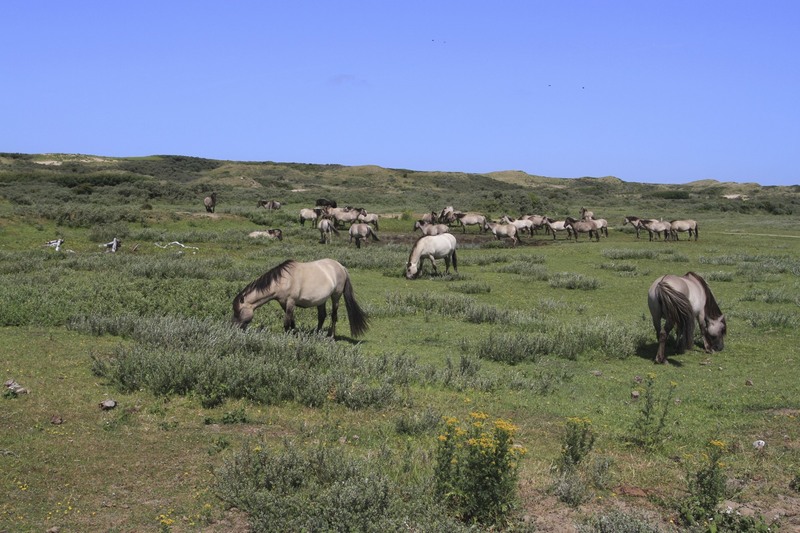 The Konik come from Poland and are one of the surviving descendants of Eastern European wild horses. They are lovely and inquisitive creatures, you have to remember that they are semi-feral. Don’t feed the animals! Heading north I arrived at the North Sea Canal where it passes through the deeply uninspiring town of IJmuiden. It is quite an amazing sight, the giant locks allowing passage for even larger ships between Amsterdam and the North Sea. 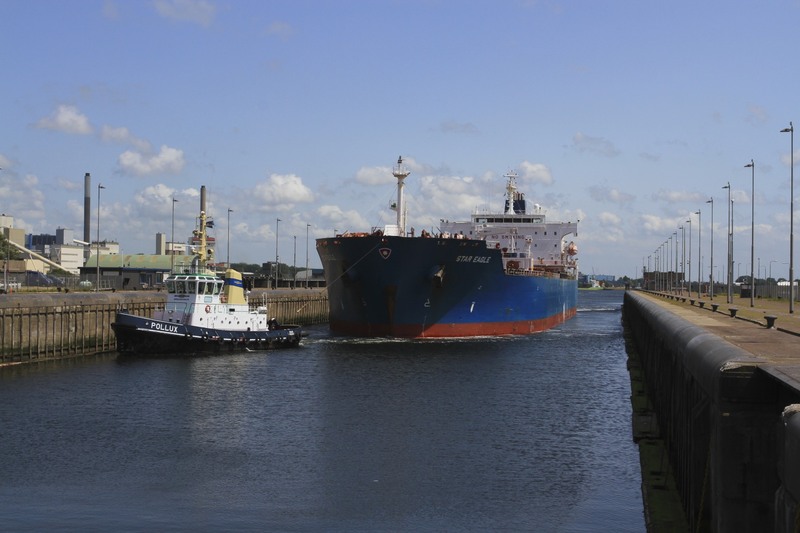 I cycled round the docks and locks, observing ships loading huge amounts of coal on the far shore of the canal, and then I was lucky enough to see a big ship arriving into one of the locks. I love this sort of thing, but time was getting on and a cold Jopen awaited me in Haarlem. Hi Emma, I think you’ll enjoy Leiden, it’s a lovely and fun town…and home to one of my favourite bars (www.cafedebontekoe.net). It’s a good place for wombeling by night and by day. There are so many cycle routes, but Leiden is a great place to star an exploration of the bulb fields when the tulips are in season. You can get to the coast easily from there as well. 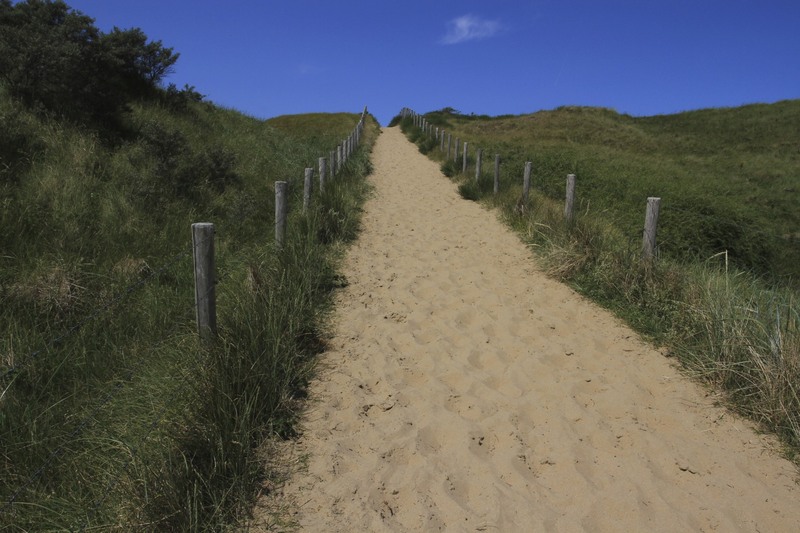 The North Sea Coast routes are fabulous, as are the beaches. A favourite place to cycle for me is the Waterland region north of Amsterdam, really beautiful and lots of nice towns and villages. Get the train to Amsterdam and go from there. Thanks, that’s great to know. Can you take bikes on the train? Yes, it’s really easy. You have to buy €6 ticket but it’s valid all day and on as many trains as you like (watch out for rush hour though, only fold down bikes allowed).